This carved pou and the concrete plinth at the end of the narrow, grass path mark the site of a tī kōuka (cabbage tree) which was reportedly a lookout used by Ngāti Toa Rangatira leader Te Rauparaha. The reserve was created in 1910. The tiny (40m2) Te Rauparaha Reserve lies beside a driveway off Motuhara Road. Its existence is marked by a carved wooden pou, with a strip of land leading to a concrete plinth and a plaque which states the site’s significant connection to Te Rauparaha – ‘overlooking Taupō Pa from which Te Rauparaha was taken’. In 1881, the Native Land Court set aside ten acres as a Māori burial ground, vesting the reserve (Taupō No 2 Block) in the Public Trustee as ‘absolutely inalienable’. However, legislative changes saw the land subdivided for sale. Despite the original status, and protest by the Plimmerton community who had wanted the land vested as a scenic reserve, in 1913 sections were leased then sold. This small area together with one-tenth of an acre as a burial ground are all that remain as Māori reserve here today. Within the reserve a lone tī kōuka (cabbage tree) once stood. Local knowledge had it that Te Rauparaha had used the tree as a viewing point. The area around the tree was set aside in 1910 as a reserve to acknowledge Te Rauparaha. Opinion among Māori is that the tree marked the site of Te Rauparaha’s whare where he was captured in 1846. 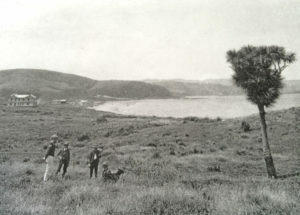 A different opinion, publicised at the 1896 Plimmerton land auction, identified the site of that whare on a section on the south side of Beach Road alongside the beach. The description from the time of the capture, of the soldiers running some distance to and through the village from the beach landing to the whare, supports the Māori view. 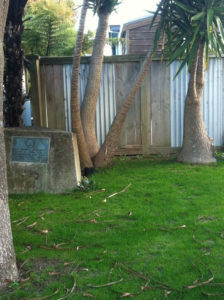 During the 1960s, the New Zealand Historic Places Trust marked the site of the tree with the large concrete plinth and plaque. 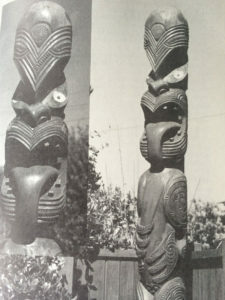 In 1975, the Plimmerton Rotary Club commissioned a carved wooden pou of Te Rauparaha and installed it at the entrance of the reserve on Motuhara Road. Seven hundred people attended the unveiling of the pou. The first carving rotted and was replaced for a decade by a concrete mould. 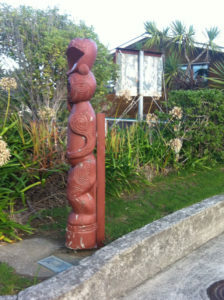 In 1996, the Porirua Heritage Trail sponsored the tekoteko which stands here today. This time it was carved by Tana Suzmann from totara – a wood known for its endurance. A new tī kōuka was planted at the site in the early 1990s.